As promised, 30 days later, I wanted to let you know how the device was doing and most importantly whether or not I was going to receive a discount and how much! This screenshot shows the most important information, the amount of projected discount. Now, this vehicle is driven by my wife, and normally she drives about 1500 miles a month, but this month was a little unusual and she didn’t even drive 500. Mainly this is just because we have been trying to save money for Christmas, taking my truck when we went shopping, and hiding from the Mayan Apocalypse. So you can see, they are projecting a 7% discount, which isn’t too bad considering we have not tracked a lot of miles, and my wife has had a few hard breaking events. The screenshot below shows our overall performance grade. So far we have a “B”, which although is a passing grade in school, we are trying to get the best discount we can. I consider my wife a very good, safe driver so I was a little surprised to see we were not getting an “A”. 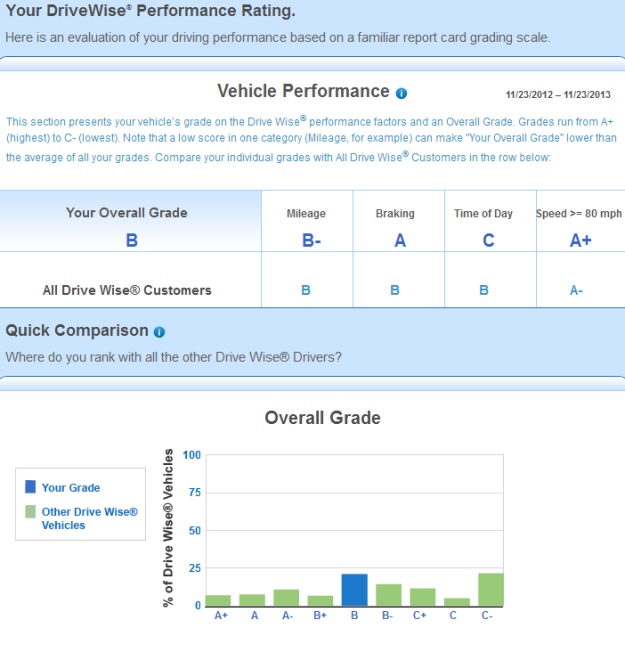 Now this screenshot shows our grade for each of the 4 categories that AllState monitors. You can see they are interested in Mileage, Braking, Time of Day and keeping your speed below 80 MPH. This final screenshot has the actual information reported by the device. 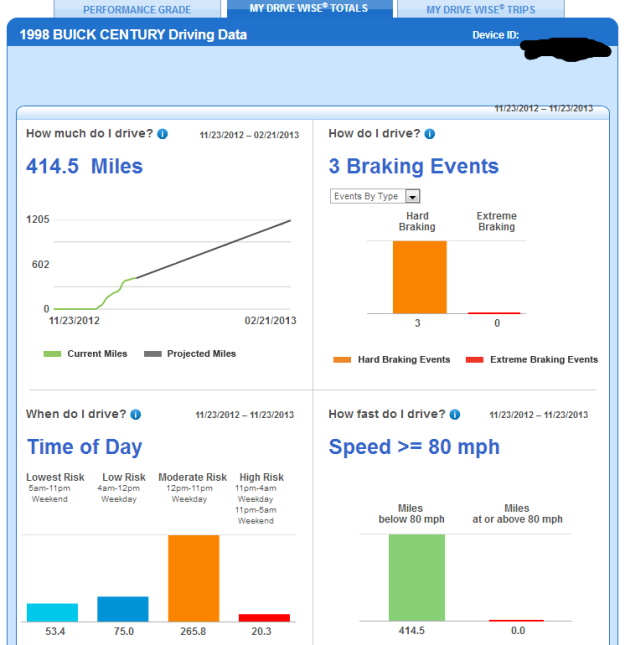 You can see the miles tracked, 3 hard breaking events, time of day the vehicle is driven and the amount of miles my wife actually spent below 80 MPH. Overall I am very happy with the device and will post a follow up to this article in another 30 days to see if we have improved our discount or not. I doubt I will be able to review the Progressive device since I really do not plan on switching from AllState. If someone has a review of the Progressive Snapshot device please leave a comment to help other readers researching the available insurance discount trackers. Thanks for the information. I just spoke with our Allstate agent today regarding this exact issue. If we decide to have the device hooked up, we have to wait until the next renewal period. Do you feel this is just another step toward Big Brother and Government Spying? I do think it is possible for the government to use this, but it really is just designed to keep your insurance low if you are a good driver. Also, we have found that we drive better knowing the device is “tracking”. about a year later, and still very happy with the device. 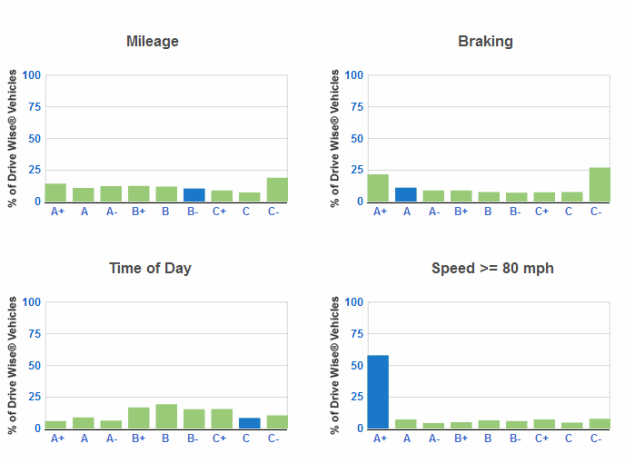 We signed up for drivewise a few months ago, I also disagree with their evaluation. (we are much better drivers than what they say). Yesterday my wife’s 2011 with 19k miles, Chevy Tahoe quit on her on i95 near Baltimore, at 60 mph., after being towed to my Chevy dealer(I am a dealer employee) and having one of the top techs look at it to determine the problem; it was determined that the battery and electrical system completely failed as a result of the drivewise devise. It causes the modules in the vehicle to stay “awake” and not go into a dormant mode, which is what they should do. Luckily, my wife was not injured or killed on the very narrow shoulder or I95 and the Tahoe is fine now. I have pulled the devise out , for good! This drive wise device only benefits the retired and non working folks, if you travel for work you are punished, if you work during the week your punished, if you drive over 18,000 miles your punished. Point in fact it only works if you don’t. This device sounds like something out of the Obama administration. Not happy with it at all. I am a safe drive but due to my work schedule I am not recieving a good discount.